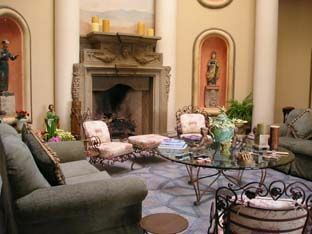 Located on one of San Miguel's most scenic hillsides is the grand seven bedroom Casa. The spectacular Rotunda entry with stately fireplace and bar to the right beckons guests to come enjoy this four-story gem. Curving down to the ground level are mirror stairways framed in wrought iron that led to beautifully landscaped gardens. There is a fountain and large swimming pool, which is framed by an elevated open outdoor sala pool house - complete with a fireplace. Surrounding the swimming pool to the right are three spacious, and comfortable bedrooms along a gallery hallway. The end bedroom has a King-size bed, large closet with private shower bathroom, concealed TV, and gas log fireplace. The center bedroom on the ground level also has a fireplace with walk-in closet with lots of storage. A full bath with double sinks and twin beds. The third bedroom that is nearest to the house has a King-size bed fireplace and full bath with shower and tub. Under the landing is a charming cantina and powder room. From the Rotunda entry one can either take an elevator between all levels. Or for a little exercise one can walk up and down the cantera spiraling staircase. Also on the main level off of the main entry and overlooking the swimming pool are two more bedrooms. Each has a king-size bed fireplace spacious private bath and great closet space. Off of the end bedroom on this floor is a small outdoor sala with a fireplace. Winding up to the second level to one's right is a large dining doom that seats 14 people comfortably in front of a large fireplace and surrounded by windows that overlook the postcard town of San Miguel. Across the way is the beautifully appointed and comfortable Living Room that opens out to a wonderful outdoor dining area through floor to ceiling French Doors that frame the indoor fireplace. From here one has sweeping views of the town of San Miguel and its beautiful churches. Moving around the wrought iron framed rotunda opening on the second floor one enters into a modern fully equipped kitchen with large butler's pantry to the right. Also on this floor is a lovely powder room. On the third floor to the right of the stairs is a large study with a fireplace and two day beds that can convert into beds in front of a stately fireplace. Charming full bath attached. The master bedroom and bath occupy the remainder of this floor. 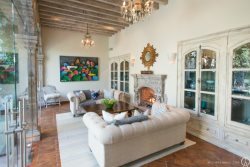 Master Bedroom has grand views of San Miguel large fireplace and sitting area with entertainment center concealed behind carved doors. The master bath has His/Hers Dressing Areas and a Jacuzzi tub. Daring to climb to the heights one will find the most breathtaking views from the rooftop that is built around the Rotunda dome. Stairs or elevator can access the room and a Gorky Gonzalez tiled powder room is also located on this floor. An excellent cook, two housekeepers, and a charming mesero staff serve this home five and one-half days a week. This home is stately, and tranquil with the most spectacular views of San Miguel and its countryside will make your trip to San Miguel one to remember! IMPORTANT. There is high-speed wireless internet. Each bedroom occupied must tip $100 USD per week, and gas for heating pool is not included - $800 USD per week.